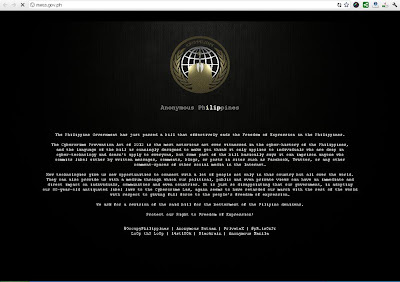 The cyber world here in the Philippines are raging against the law known as Cybercrime Prevention Act of 2012, that was signed by the PH President Benigno Aquino III. The law itself which was published as Republic Act 10175 tackles about crimes happening with the use of technology specifically the Internet. The issue regarding this cybercrime law started on the controversial speech of Senator Tito Sotto for the RH Bill. Based from this controversy, Sotto was accused of plagiarizing an article written by an American blogger named Sarah Pope. In an interview, Sotto denies the fact that he copied his speech and said Bakit ko naman iqu-quote ang blogger? Blogger lang iyon. [Why will I quote a blogger? She's just a blogger.]. This statement from Sotto created a sudden rage not just on the blogging community but also to the online world and resulted to cyber bullying according to the senator. Just when the issue starts to mellow down, another speech was been done by Sotto and it was found out to be a tagalized (translated to Filipino, the local language of the Philippines) version of Robert Kennedy's speech. The issue returned again and this time, most of the Senators, like Senate President Juan Ponce Enrile, are now on the side of Sotto. Data Interference that includes intentional or reckless alteration, damaging, deletion or deterioration of computer data, electronic document, or electronic data message, without right, including the introduction or transmission of viruses. Misuse of devices - use, production, sale, procurement, importation, distribution, including password, access codes and similar data which will be used to commit offenses. The law applies to Filipinos who committed the violation regardless of the place it was done. This also applies to everyone who committed within the Philippines or committed with the use of any device located in the country [PH]. The bill has passed the congress, to senate and lastly to the president. But the addition of the "Libel" part was the one creating a big fuss in the cyberworld saying that this part kills the citizens freedom. Reports said that this was added by Sotto when it passes the senate. The Philippine Government has just passed a bill that effectively ends the Freedom of Expression in the Philippines. comment-spaces of other social media in the Internet. New technologies give us new opportunities to connect with a lot of people not only in this country but all over the world. with respect to giving full force to the people's freedom of expression. We ask for a revision of the said bill for the betterment of the Filipino denizens. Protect our Right to Freedom of Expression! As of this writing, the BSP site is already up again and MWSS is still working on their site. Reading the law, I honestly don't find anything wrong with its motive. Except for the fact that the law itself has too many loopholes and wasn't clear enough that a possiblity of abusing the law's power is really high. Apparently, the media made a big fuss about it that some people reacted too much. Regarding the data stealing -- protecting your data and having it hacked is already given in this era. That is something that is really hard to remove. As someone who works to create site in the Internet, I always remind my clients that the fact that you are placing your data on the web, you hereby grant everyone (even if it is very protected) a chance to steal your work. The law applies perfectly on this scenario. first perspective, imagine yourself being bullied on the cyberspace and you can do nothing because there are no laws that covers it. Being on this side of the perspective, I can clearly see why the law was created. second prespective, you may also see it this way, imagine if the person being bullied is really a bad yet powerful one, and he would use the law to shut up all their detractors. Do you think it's fair? We do live in a democratic country where everyone is entitled for their own opinion and freedom to say what they wanted. Though the second perspective seems to be bad, both scenario seems to be going in one direction.. they are just defending theirselves, and it is their "freedom" too to do it, right? It should be clear that though we have the freedom we want, it also comes with the word "responsibility", a thing that most people neglect -- being reponsible with their words they post online. This post may be out of the programming niche but since it involves writing in the web world, I chose to give my own opinion. I just want to share my clear point of view regarding this issue and I do not intend to harm anyone. Ciao!